September 22, 2016 – Las Vegas, NV – Spectators at the 2016 Clif Bar Cross Vegas UCI Cyclocross World Cup season opener, September 22, were treated to the most exciting bicycle race action yet seen at the Desert Breeze Sports Complex, on an uncharacteristically cool and humid evening that threatened thunderstorms throughout. The weather may have remained calm, but in both the Elite Men’s and Elite Women’s Telenet World Cup races, on a shorter, tougher 2.8km course, electrifying battles enthralled the spectators. Wout van Aert, the reigning UCI world cup and world champion, was heavily favored going into this race, coming off two consecutive victories at high profile events. 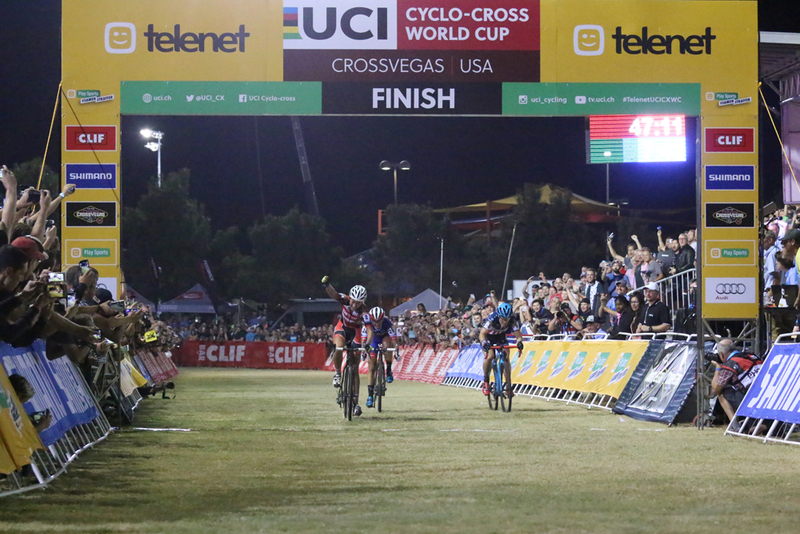 He convincingly won the Clif Bar Cross Vegas last year, yet a repeat suddenly looked uncertain when he took a tumble on a stepped run-up early in the race. Michael Vanthourenhout decided to make the most of the opportunity and rode away from the field in a solo move that at one point had him around 20 seconds ahead of van Aert. “I was not as concentrated as I should have been. It was a stupid crash,” said van Aert, who at the post-race press conference was still suffering pain from that fall. On remounting, his focus turned immediately to regaining control of the race and trackside spectators reported expressions ranging from indignation to anger animating his face. Riding as van Aert put it “on adrenalin,” it was impressive how well he impersonated a maglev train, skimming over the Las Vegas grass as he cut through the deeply talented field with an ease that cannot have brought much joy to those that would seek to match him. Van Aert soon made it to the head of the chase group and quickly rode clear, still on a mission to rein in the plucky Vanthourenhout. Laurens Sweeck was the only one capable of going with him at this point, and shared some of the work with the world champion. “When Wout made it up to the front, I realized I had to go with him,” explained Sweeck, who was not willing to squander the opportunity. Yet once van Aert came up within a few seconds of Vanthourenhout he eased the pace, apparently allowing the hard-charging chasers back into the race. Vanthourenhout was soon absorbed with van Aert briefly going to the front as if to let his compatriot know the game was up, and with names like Toon Aerts, Quinten Hermans, Rob Peeters, Dan Hoeyberghs and Tom Meeusen among a group of 14, the front of the race had a distinctly Belgian feel about it. Sweeck was doing a lot of the work, but with less than three laps to go van Aert went to the front and attacked on the punishingly steep Hyper Threads staircase, taking only Vanthourenhout and Sweeck with him: apparently the three strongest riders on the night. Van Aert didn’t stop attacking there. Sprinting into the Diamond Legal Group sandpit, which sloped uphill and awkwardly off-camber, the champion forced open a gap that grew massively when Vanthourenhout made an error, losing both his line and his balance. From then on the gap opened at a surprisingly fast rate, and van Aert’s closest rivals must be wondering what it’s going to take to beat him this year. The sandpit saw more attacking action a lap later, where Vanthourenhout opened a small gap over Sweeck and held it to the line. “I looked back and Laurens was 20 meters behind me, so I just gave it everything, I was confident I could keep that gap,” he said. Earlier in the evening, the women had brought the vocal crowd to fever pitch with a race of sustained uncertainty, ignited by the first lap attack of Clif Bar rider Catherine Pendrel, which went all the way to a thrilling three-rider sprint. Pendrel went out so hard and fast that only three riders were in the chase group: two-times world cup winner Katie Compton (Trek), Pendrel’s team-mate Katerina Nash, and Dutch rider Sophie de Boer. Compton was confident of catching Pendrel. “II wasn’t worried when Catharine Pendrel was leading. It was too early. When the lead approached 20-25 seconds I decided to shut it down,” she said, and that’s what she did. After the catch, Pendrel didn’t stay long with the trio that had been chasing her, but these three riders were hard to separate. De Boer’s reunion with her race-long companions couldn’t be called friendly. She attacked both of them in a determined effort to be first on the tough Focus stairs leading up to the finish straight. Event organizer Brook Watts had placed these stairs deliberately in an effort to break up any parties that arrived intact for the sprint to the line. “I thought it was good to be first into the final step. But Sophie punched it by me and got there first. We all had the same idea, I guess,” said Nash after the finish. For de Boer, those stairs were key. “I know I have an OK sprint, so I thought if I can reach the top of the stairs first, then I had a good chance,” she said. In the charge down the finish straight she never looked like being passed. “I didn’t know what to expect coming into this race. Last year when I raced here I had OK form, but at the end of the first lap I was dead, I finished I don’t know how far back. So it was hard to have expectations coming here. It is very special to win, and it makes it well worth the trip here,” said de Boer. It’s hard to imagine that anybody who attended the event disagreed it was well worth the trip. When you see race action like tonight’s, it’s immediately clear why cyclocross is such a popular sport.